As Becky and I passed through the checkpoint into southern Lebanon last month, it occurred to me that I had good reason to pray. Southern Lebanon is controlled by Hezbollah, a powerful terrorist organization that has been providing military support to Syrian dictator Bashar al-Assad’s current war against his own citizens. We were, in fact, entering Hezbollah’s turf to pass out relief supplies to some of the one million Syrian refugees who have fled their nation’s civil war. Thankfully, we were not alone. We were joining some of the dedicated staff members of Heart for Lebanon (HFL), a Christian ministry serving in Lebanon since the end of Lebanon’s own civil war in 2006. Becky, who has worked with refugees for years and who directs Heaven’s Family’s Christian Refugees Fund, had invested $10,000 here, and we wanted to see firsthand how those funds were used. So we spent four days traveling in Lebanon visiting the multi-faceted ministries through which HFL’s 30 staff members are sharing the love and gospel of Christ. That morning at HLF’s distribution center in Hezbollah territory, 200 Syrian refugee families, mostly Muslim and all pre-selected based on personal assessments by HFL staff, each received a large box full of relief supplies. On top of each box was an illustrated children’s booklet about Jesus. I was impressed that those booklets were not hidden inside each box, but given separately to everyone, right out in the open. Below is a photo I took of one of those booklets. (At the top of this email is a photo of one of the hundreds of grateful mothers who received relief supplies that morning. She happened to be holding one of those booklets in her hand as well.) The director of HFL’s southern Lebanon operations told me that he makes sure that the refugees know from the start that HLF’s staff are all evangelical Christians. I wish you could have been with us that afternoon as we paid visits to several of the beneficiary families. They live in abandoned concrete tool sheds, dirt-floor tents patched together with tarps, and crowded into rundown one-room unfurnished apartments. Each family was gracious, thankful and hospitable. They were not stereotypical Muslim radicals, but mothers, sons and daughters who have been born into a religious culture that gives them no options—and keeps them ignorant of the most important message. Each family we visited had a tragic story to tell about a husband or son who had been killed or abducted in Syria. They shed tears as we prayed for them in Jesus’ name. 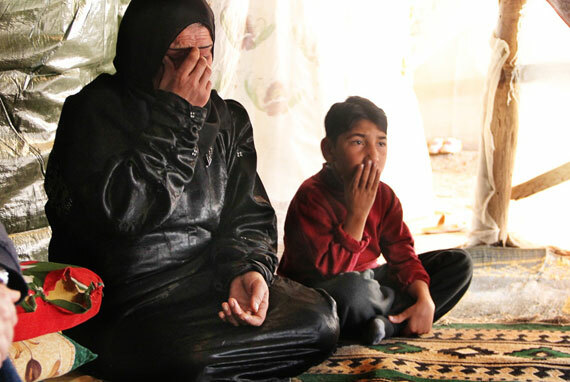 One mother wept as she told us how, last July, her husband was abducted when the family was still living in Syria. His captors demanded $100,000 for his release, which was impossible for her to pay. As Syria’s chaos escalated, she fled the country with her four children. Below is a photo of her with one of her sons—who is deaf and mute. The next morning we traveled to the Bekaa Valley, where HFL is serving over 1,000 Syrian refugee families in the same way. The Bekaa refugees, however, are mostly from traditional Syrian Christian backgrounds—Orthodox, Catholic and Protestant. 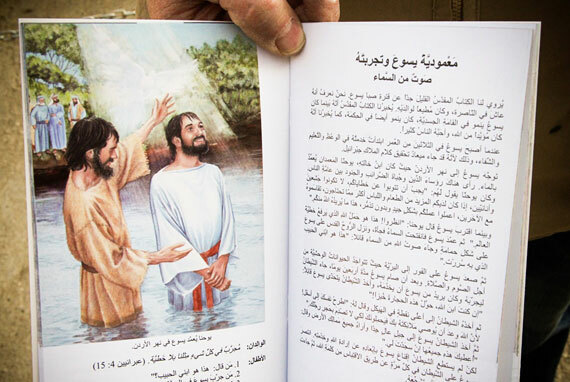 Some of them know the Lord, but all received, not just food, hygienic supplies, and an illustrated children’s booklet about Jesus, but also a complete Arabic Bible. Later that day, Becky and I visited two Christian families in their one-room apartments, and they told us how radical Muslims are now taking advantage of Syria’s instability to target Christians. Neither family has hope of returning to a safe Syria. Jesus’ church now has an unprecedented opportunity in Lebanon to share His love and message with a million Muslims and traditional Christians, and Heaven’s Family is seizing that opportunity. 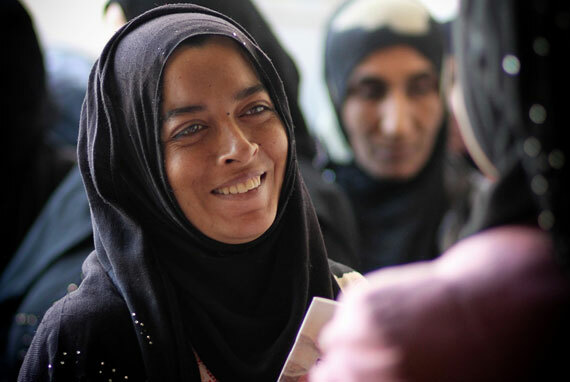 Displaced Syrians have the first opportunity of their lives to meet genuine followers of Christ, and the love they are encountering is challenging long-held beliefs about Christians and Christ. Our sacrifices can soften hearts hardened by centuries of lies. Our goal is to raise $50,000 to help Syrian refugees—both Christian and Muslim—through Heart for Lebanon’s multi-faceted ministries to them. One of HLF’s large relief boxes costs $75 to fill. If we can raise $50,000, we’ll be able to serve 100 refugee families with food, hygienic necessities, and a gospel witness for almost 7 months! Can you help? 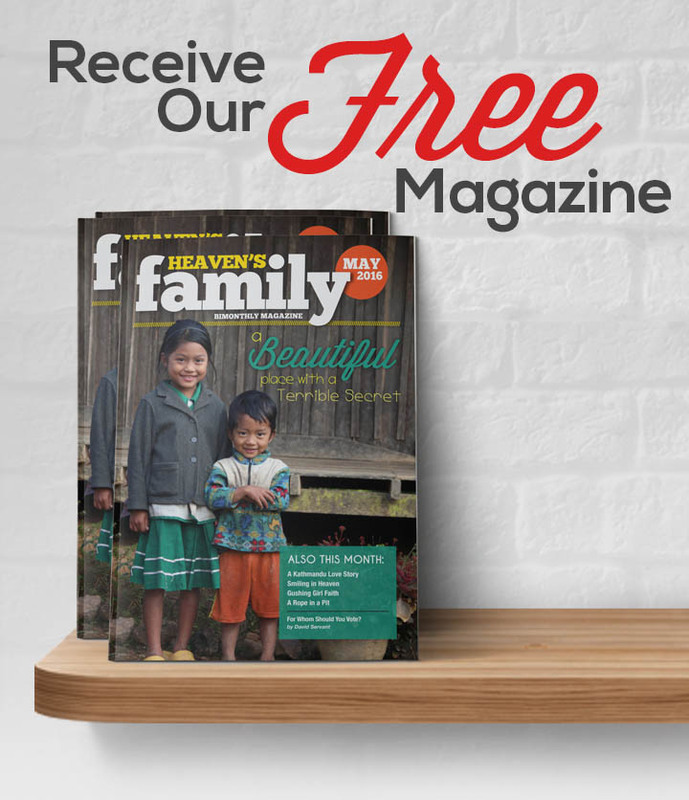 As always, nothing of what we receive towards our Christian Refugees Fund will be used for Heaven’s Family’s administrative costs. 100% will be sent overseas to benefit refugees who have been displaced both geographically—and spiritually. Thanks so much for your compassion.